When it comes to pedestrian safety, there are many different types of bollards that urban planners and architects can use to protect people and property from vehicle intrusions. Steel bollards in bright colors line many street corners and parking lots—but not every bollard has to look like a neon pipe to be a traffic guide or crash barrier. Sites requiring a more modern or subtle aesthetic have other options to provide security against vehicle crashes. Precast concrete bollards are one example of a decorative bollard that provides impact protection without distracting from the landscaping and architectural style. 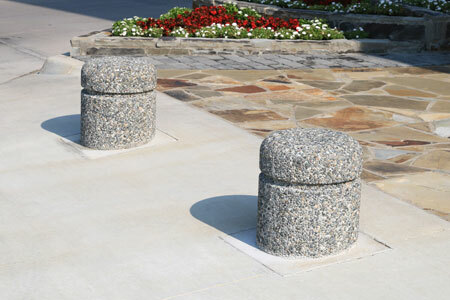 Reinforced with steel for exceptional strength and available in many shapes, sizes, and surface finishes, concrete bollards can be used for any permanent bollard application. Concrete is an excellent building material, used in most major buildings and urban infrastructure projects—you would be hard-pressed to find any modern building that doesn’t use concrete for at least the foundation. On its own, concrete has a high thermal mass and is resistant to weathering, making it ideal for outdoor use. Concrete can also be easily upgraded with steel reinforcement for added strength and additional surface finishing, protecting it from external elements while adding an appealing surface texture. Compared to cast-in-place concrete projects, precast concrete manufacturers have exceptional control in managing the quality and appearance of concrete products. Casting facilities have the benefit of a clean manufacturing environment to minimize impurities. Precast products also use molds, which ensure uniformity across multiple items, and allow for a high degree of planning and predictability in determining concrete mixes and volumes. For cast-in-place concrete projects, formwork is often the costliest input, as it requires extensive labor and materials. Relying on off-site manufacturers is an effective way to reduce costs while ensuring quality and performance-specific characteristics. Precast concrete products are shipped ready for use, and typically require much less time and labor to install.